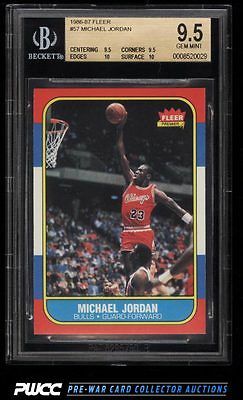 Absolutely gorgeous MJ rookie on the auction block this month. This is quite an exciting and extraordinary Jordan rookie due to the fact that it's 0.5 away from being PRISTINE. The card boasts perfect surfaces and four flawless edges. The corners are exceedingly sharp and the centering is spot on. This ranks among the very best MJ rookies we've had the pleasure of brokering in our tenure and is only deserving of the finest collection. Enjoy! Part of a spectacular, high-grade run of '86 Fleer's on the auction block this month. One of over 16,000 cards, lots, and sets up for bid in our 6th Auction of 2016. Click on the link above to view the other PWCC auction lots.